Beacon Investigative Solutions serves the public, corporate, legal and insurance communities with comprehensive investigation services in the Sioux Falls area. We are a full-service firm specializing in asset searches, background investigations, locates, fraud investigations and surveillance services in Sioux Falls and throughout the state of South Dakota. Beacon is a national agency operating at a local level. Beacon’s investigative team includes former FBI Special Agents and former law enforcement officers with specialized training and expertise. Our Sioux Falls field investigators are backed by the resources of our national investigation agency. We guarantee reliable and cost effective results. Beacon provides investigative support for civil, criminal and domestic matters filed in Second Judicial Circuit Court as well as federal matters in the U.S. District Court for the District of South Dakota. Our investigations can also be coordinated with local law enforcement. Jurisdiction in local criminal matters is shared by the Sioux Falls Police Department and the Minnehaha County Sheriff. Sioux Falls Asset Search and Discovery – Beacon Investigative Solutions provides asset search and discovery investigations for private, legal and corporate clients in the Sioux Falls area. We have decades of experience identifying hard-to-find assets and undisclosed accounts. Our methods and sources are second to none. 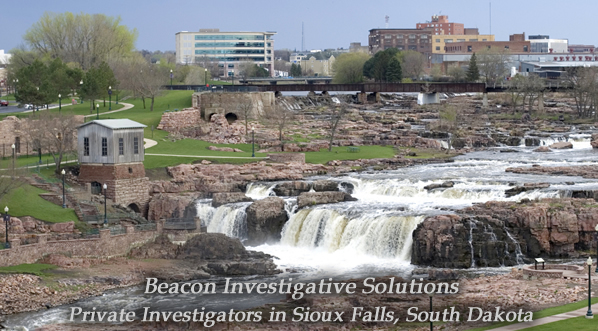 Sioux Falls Locate Investigations – Beacon’s highly trained investigative team has the expertise and training to locate witnesses, defendants, family members, and other individuals in Sioux Falls and surrounding areas. When dealing with time constraints, Beacon Investigative Solutions has the experience and personnel to get the job done quickly. Sioux Falls Background Investigations – From pre-litigation services to due diligence, Beacon Investigative Solutions offers comprehensive background investigations for corporations, law firms and private clients in Sioux Falls. We pride ourselves in our ability to uncover all relevant information on private citizens and businesses. Sioux Falls Surveillance Services – Beacon Investigative Solutions is a leading provider for insurance companies and law firms. We offer personal injury and domestic surveillance services as well as investigation of workers compensation and disability claims. If you are seeking an attorney in the Sioux Falls area, you may wish to contact the State Bar of South Dakota. If a civil case has already been initiated and you need assistance with service of process, we recommend our partner Action Process Serving. Please contact us for their contact information.